Learning how to use a deep fryer can feel intimidating, especially if you’ve never used one before. There may be some recipes that can be a little more difficult to get a hang of than others. One of the best ways to learn how to use a deep fryer is to tinker around with some recipes. While you may need some time to figure out the exact way to make your food, this article will outline the general steps you should take when you’re deep frying your food. Even the best deep fryer can result in greasiness if you do not know how to use it properly.. Therefore, you should pay attention to these steps to ensure your food comes out perfectly. While you’re getting ready to fill up the deep fryer, you want to choose what type of oil you want to put in the fryer. There are plenty of oils available, and once you’ve selected one, you can fill up the deep fryer. If you’re not sure how much you should put into the deep fryer, you should know most deep fryers have a max and minimum fill line. You can put in as much or as little oil as you need into the deep fryer. Tip: Make sure the deep fryer is unplugged when you pour the oil to ensure it doesn’t bubble over. After turning your deep fryer on, you want to make sure the deep fryer gets to the right temperature. The right temperature for a deep fryer is usually set between 250 and 275 degrees F. Most deep fryers include an internal thermostat to keep the temperature at the right spot. Monitoring the temperature allows you to cook your food at the right temperature. Tip: Use a deep fat fryer thermometer to check the temperature. While it may seem like a good idea to add water to the food you want to put in the deep fryer, adding water can make for a hazardous situation. No matter what you’re frying, you want to make sure it is dry. Whether you’re deep frying vegetables or meat, you should take a paper and dry off the food before dipping it in the batter. Tip: Oil and water don’t mix, and drying your food prevents dangerous splashing. 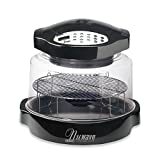 While most deep fryers include a basket you can set your food in, you should still take it slowly when you’re putting your food in the oil. Taking your time prevents the oil from splashing, and allows the heated oil to cook properly. While some foods may fry faster than others, you should take precaution when you’re putting it in the oil. Tip: Make sure the oil is at the proper temperature before putting your food inside. No matter how good you are at keeping track of time, using a timer is an excellent way to ensure you cook the food properly. If your food is overdone, it loses the moisture inside the batter, causing it to be greasy. You don’t want your food undercooked either, as salmonella can make you sick. You can use your phone or the microwave to time your food. Tip: Find out what the cooking times are for each food you put in the fryer beforehand. After you’ve let your food cook for the right amount of time, you want to pull the food out slowly. You don’t want the oil to splash over yourself when you’re removing your food. You can use a slotted spoon to pull out your food if it doesn’t have a basket. Making small movements allows you to pull out the food easily. Tip: Use a baking mitt to remove the food, and prevent any burns from unexpected splashes. While it is tempting to eat your food right away after you take it out of the oil, letting it cool is an excellent idea. Not only will the food be safe to eat, but it allows the crust to crisp up a little bit. When you pull it out of the fryer, you want to get the excess oil off with a paper towel to soak up any extra oil. Tip: You can use a drying rack to put your food on. Once the excess oil is taken off, and your food has cooled, you can go ahead and dig in. You can try different recipes the next time you make some food. Playing around and mixing flavors is an ideal way to find something better. Tip: Use silverware to eat your food to prevent any burning on your fingers.